The BHT-1200 is a DENSO Windows based Handheld Terminal and is easy to operate with just one hand, even using just the thumb for data entry. Featuring a scan performance of 400 scans per second the BHT-1200 is designed for high speed data capture, considerably faster than most standard laser scanners. BHT-1200 will also read barcodes from up to 1.3 meters away. 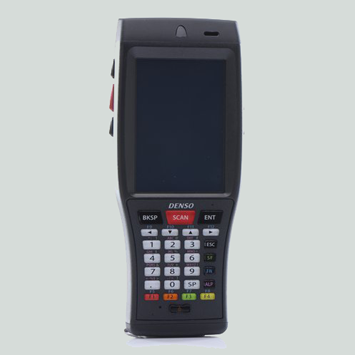 The DENSO BHT-1200 has a wide range of features commonly associated with mobile computers including 1D barcode scanner or 2D imager, WIFI – including 802.11a, bluetooth, camera, 3G and a very generous 3 Year Warranty. DENSO products are designed and produced to a very high standard in order to ensure that the product meets the customers expectations including but not exclusively performance, usabilty, reliability and life cycle. DENSO is part of the Toyota Group and as such prides itself on supplying products that meet the exacting standards set by Toyota across its businesses. Driven by Quality DENSO terminals and scanners are synonymous with maximum quality in technology, performance and functionality. Click Here to download the Denso BHT 1200 brochure in pdf.